Durand-Ruel Galleries, Inc., New York. Ferargil Galleries, New York (1925). Harriet H. Jonas, New York; Estate sale, Sotheby Parke Bernet, New York, 21 May 1975, lot 106. Acquired by the present owner, circa 1985. J. Rewald, Degas, Works in Sculpture, A Complete Catalogue, New York, 1944, p. 20, no. XII (another cast illustrated, pp. 46 and 47). P. Borel, Les sculptures inédities de Degas, Geneva, 1949 (original wax model illustrated; titled Cheval). J. Fevre, Mon oncle Degas, souvenirs et documents, Geneva, 1949, no. 9, p. 128 (another cast illustrated). J. Rewald, Degas, Sculpture, The Complete Works, New York, 1956, p. 143, no. XII (another cast illustrated). J. Lassaigne and F. Minervino, Tout l'oeuvre peint de Degas, Milan, 1970, p. 143, no. S 46 (another cast illustrated). C.W. Millard, The Sculpture of Edgar Degas, Princeton, 1976, p. xiv, no. 63 (original wax model illustrated). J. Rewald, Degas's Complete Sculpture, Catalogue Raisonné, San Francisco, 1990, p. 66, no. XII (another cast illustrated; original wax model illustrated, p. 67). S. Campbell, "Degas, The Sculptures, A Catalogue Raisonné," Apollo, vol. CXLII, no. 402, August 1995, p. 21, no. 22 (another cast illustrated). J.S. Czestochowski and A. Pingeot, eds., Degas Sculptures, A Catalogue Raisonné of the Bronzes, Memphis, 2002, p. 165, no. 22 (another cast illustrated in color, p. 164; original wax model illustrated, p. 165). S. Campbell, R. Kendall, D.S. Barbour and S.G. Sturman, Degas in the Norton Simon Museum, Pasadena, 2009, vol. II, pp. 267-270 and 518-519, no. 44 (another cast illustrated in color, p. 269; original wax model illustrated, p. 268). S.G. Lindsay, D.S. Barbour and S.G. Sturman, Edgar Degas Sculpture, exh. cat., National Gallery of Art, Washington, D.C., 2010, pp. 99-102, no. 12 (original wax model illustrated in color, p. 100). New York, Durand-Ruel Galleries, Inc., Exposition Degas, December 1922. New York, Ferargil Galleries, Sculptures of Edgar Degas, October-November 1925, no. 46. 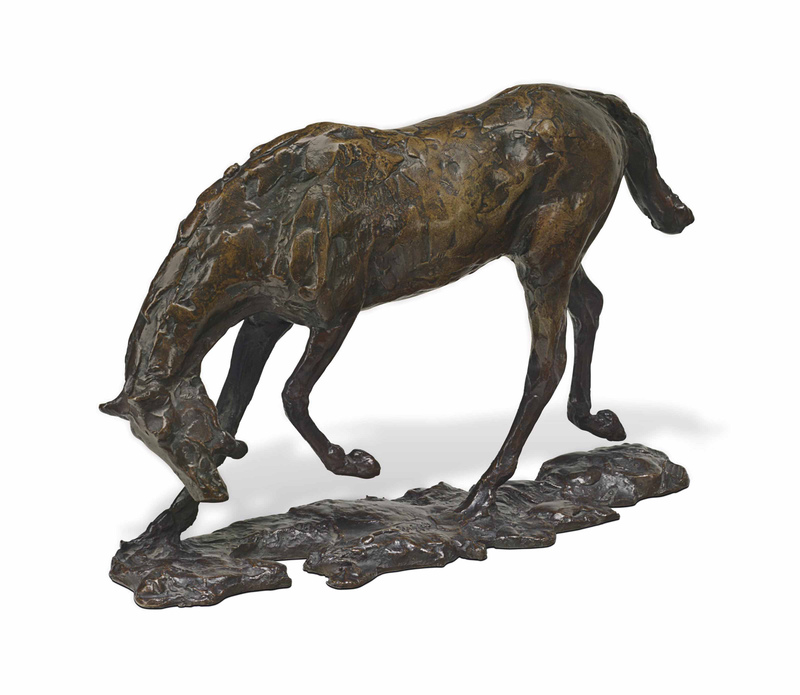 Cheval faisant une descente de main, one of Edgar Degas's most popular sculptures, is cast from one of the fifteen equine statues that Degas modeled in wax. He executed drawings and wax figures as studies in movement and kept them in his studio as he completed his paintings of racing scenes. Manipulating the highly pliable wax over improvised armatures, Degas explored the movements of horses while pursuing the same theme with his modeled dancing figures. Commenting on Degas's use of these drawings and sculptures, Anne Dumas writes, "Degas was obsessed, above all, with the figure, with movement and pose. Drawing for him was a way of discovering and capturing motion and posture. His sculpture can perhaps be seen as an extension to drawing, a means by which Degas could work through his ideas in a direct, tactile and three-dimensional form, and a fresh arena in which to work out problems. Like his printmaking, sculpture was a particularly experimental form" (quoted in J.S. Czestochowski and A. Pingeot, eds., op. cit., p. 40). Degas was so absorbed by these equine figures that in 1888 he gave them priority over his series of pastel bathers, writing to Albert Bartholomé, "I have not yet made enough horses. The women must wait in their basins" (quoted in J. S. Boggs, Degas at the Races, exh. cat., National Gallery of Art, Washington, D.C., 1998, p. 197). In his bronze horses, Degas defies the static posture and severe realism of the equine sculptures created by contemporary academic artists. Movement and drama are conveyed in the present work through the balking horse's head, lowered to the side and mouth open, straining against an imaginary jockey. In the next moment the horse's head will swing up in a full rear. Degas's equine sculptures relate to his studies of the ballerina, both illustrating his endless fascination with capturing movement. The balletic quality of Cheval faisant une descente de main, moreover, reflects Paul Valéry's assertion that his horses were four-legged ballerinas, dancing en pointe outdoors (see S. Glover Lindsay, D.S. Barbour and S.G. Sturman, op. cit., p. 64). Few individuals have contributed so greatly to contemporary Jewish life as Edgar M. Bronfman. A visionary businessman and unyielding advocate for world Jewry, Mr. Bronfman translated his tremendous success at the Seagram Company into a decades long journey in philanthropy, dedicating himself to promoting a "Jewish renaissance" whose effects continue to be felt to this day. Behind Edgar M. Bronfman's international advocacy in the World Jewish Congress was his belief in Jewish culture, heritage, and values. He forever cherished the traditions at the heart of Judaism: learning, pluralism, debate, and enquiry-the essential components for the faith's continued relevance. As founder, president, and chairman of the Samuel Bronfman Foundation-named in honor of his father, a Canadian businessman and philanthropist-Mr. Bronfman focused on international engagement, bringing Jewish knowledge to people of all backgrounds. Mr. Bronfman was justly proud of his outreach to young Jews, particularly via Hillel: The Foundation for Jewish Campus Life, and the Bronfman Youth Fellowships. He revived Hillel in the 1990s, transforming it into the largest Jewish campus organization in the world, with chapters reaching beyond the United States to Russia, Eastern Europe, Israel, and South America. He founded the prestigious Bronfman Youth Fellowship program in 1987, challenging future Jewish thinkers, writers, and leaders from Israel and North America to deepen their understanding of Judaism and the importance of social responsibility. As his own life was enriched with serious intellectual study and hard work, so were the lives of young people enriched by Edgar M. Bronfman's tremendous generosity. University. Michael Steinhardt of the Hillel Foundation called Mr. Bronfman "the great Jew of his era," while Dana Raucher, executive director of the Samuel Bronfman foundation, noted that "Edgar showed how vision and long-term thinking can impact the entire landscape of Jewish life." In his absolute devotion to humanitarianism and the Judaic traditions that informed his life, Edgar M. Bronfman stands as an inspirational figure for people of all backgrounds-a testament to the power of belief in the modern world.